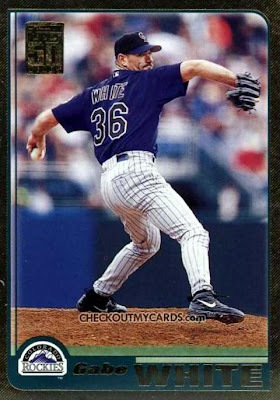 Happy birthday to former Expos, Reds, Rockies, Yankees, and Cardinals pitcher Gabe White, who turns 41 today. According to "exhaustive" research--I searched B-R.com and checked HR logs--Gabe belongs to a metaphorical Mile High Club of Colorado pitchers who hit their only career homer at Coors Field. Here's that list of exclusive gentlemen and who they victimized. Swift and Leskanic both hit 3-run shots in shoot-out games, but Yoshii's added the most Win Probability (.145) because his homer tied a close game in the 6th inning. And hey, each one counts, even if it's 5280 feet up!